Yes, it does amaze me that a pitcher for one of the worst teams in major league baseball won the Cy Young award last year. And it has been a very long time since the Kansas City Royals have had a winning season.. been in the basement for as long as I can remember. Yet on this opening day hope springs eternal for us in the KC area.. even one of the most negative TV sportscasters in town is positive about the Royals this year. So this morning I am waxing positive too and rooting for the boys in blue to turn things around and have a great season. Who are you rooting for you this baseball season? My beloved San Francisco Giants if you don't tell anyone. I am suppose to route for the Seattle Mariners. 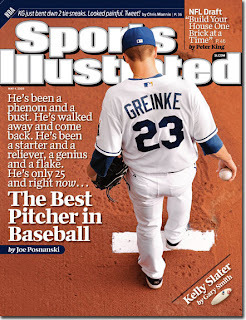 You should have heard the Grienke interview this morning. He said he didn't know what the big deal is about opening day and the coach had to explain it to him. He also said it is not likely anyone will have success this year. Classic Zach.